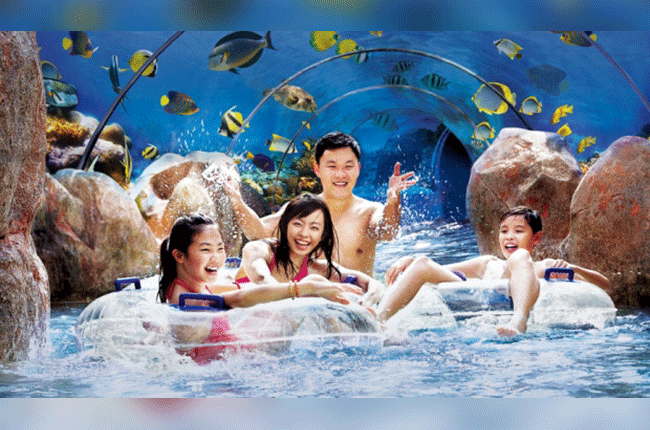 Don't miss the endless splashes of fun at Adventure Cove Waterpark, Asia's most amazing waterpark! Tickets are subject to availability, so book your tickets online now to avoid disappointment. ▸ Limited Cabanas available for rent, allocation will be based on first come first served. ▸ Cabana rental cost does not include admission into Adventure Cove Waterpark. Separate admission ticket required. ▸ Attractions Annual/Season Pass holder’s Cabana benefits is only available onsite. Not applicable on eve of Singapore public holiday, public holidays and school holidays. ▸ * S$10 meal voucher is only applicable for Full-Day Rental and valid for redemption at Adventure Cove Waterpark – The Bay Restaurant only. Not valid for purchase of alcoholic beverages, souvenirs and items from food carts. ▸ ^ The towels are to be returned after use, or additional charges apply. ▸ Guest to present confirmation letter at Adventure Cove Waterpark Guest Services(inside the park) to redeem for the F&B voucher. ▸ General Terms & conditions apply. Adventure Cove Waterpark, Resorts World, the Resorts World logo and all Resorts World elements and related indicia TM © Genting International Management Limited. All rights reserved.